Products that are based on stem cells have yet to form an established market. Yet, unlike some other potential applications of bioscience, stem cell technology has already produced a number of significant products in important therapeutic areas. BCC Research reveals in a new study that researchers around the world are using stem cells to achieve new outcomes that will mark a paradigm shift in drug discovery and the practice of medicine. 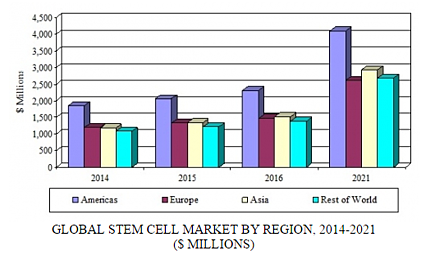 The global stem cell market is projected to grow from approximately $6.7 billion in 2016 to nearly $12.3 billion in 2021, registering a five-year compound annual growth rate (CAGR) of 13.1% for the period. The stem cell market in the Americas should reach $2.3 billion and $4.1 billion in 2016 and 2021, respectively, reflecting a five-year CAGR of 12.1%. The Asian stem cell market should total $1.5 billion and $2.9 billion in 2016 and 2021, respectively, with a five-year CAGR of 14.2%. The stem cell field has given rise to a market with three major components: stem cell therapies, research and services for stem cell companies and institutions, and cord blood banking services. Stem cell therapies are at an early stage of development, as the underlying science is still being explored. Until researchers have a much more comprehensive knowledge of the field, the era of “off-the-shelf” stem cell therapies will not materialize. For now, stem cell therapy is on a per-patient basis, with one notable exception, which is the well-established practice of the autografting of bone marrow stem cells for hematological malignancies. However, this is highly expensive and therefore prevalent mainly in affluent nations. Last week, The Lancet published results of a Phase II clinical trial using a new stem cell–transplant method for treatment of multiple sclerosis (MS). The treatment combined chemotherapy and a stem cell transplant. It halted relapses and the development of new brain lesions in 23 of 24 patients with MS for a prolonged period, without the need for ongoing medication. Eight of the 23 patients had a sustained improvement in their disability 7.5 years after treatment. However, one patient in the clinical trial died as a result of the use of aggressive chemotherapy. Until recently, the Zika virus had remained relatively unknown, despite having been discovered almost 70 years ago. Last month, University of California San Diego (UCSD) researchers working on Zika published two discoveries. On May 6, in the journal Cell Stem Cell, a team led by Tariq Rana, PhD, published the first explanation of how the Zika virus can damage developing brain cells. Using a 3D stem cell–based model of a first-trimester human brain, the UCSD team discovered that Zika activates TLR3, a molecule that human cells normally use to defend against invading viruses. Rana and colleagues also showed that by inhibiting this mechanism, damage by the virus was reduced, hinting of a possible therapeutic approach to mitigating the effects of prenatal Zika virus infections. On May 11, in the journal Nature, Alysson Muotri, PhD, with colleagues in Brazil, described the first “direct experimental proof” that the Brazilian strain of Zika virus can actually cause severe birth defects. Muotri and colleagues made their case by conducting studies in mouse models, human stem cells, and stem cell–generated cerebral organoids. The latter are miniature, 3D brains grown in vitro. Infected pregnant mice gave birth to pups displaying not just undersized heads and brains, but overall stunted growth. BCC Research’s report, The Global Market for Stem Cells, examines the regulatory environment, healthcare policies, demographic data, and other factors affecting stem cell–related markets. Analyses of global market drivers and trends, with data from 2015, estimates for 2016, and projections of CAGRs through 2021, are provided.